Believe it or not, Carhartt attire has played a big role in my life. 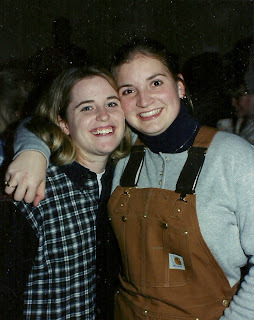 I remember when I joined the livestock judging team at Purdue University, my mom bought me my first pair of Carhartt coveralls. I was so excited, but I would be willing to bet that I might have been one of the first if not the first girl in my sorority to wear them to one of our barn dances. But they sure did keep me warm and are very comfortable. When Big Sissy was born, my mom also bought her a pair of Carhartt coveralls that have now been worn by all 3 kids. So needless to say I was super excited when I had the opportunity with The Real Farmwives of America and Friends to pick out something for myself from Carhartt's awesome women's line. It was super tough decision as they have a great selection and I have always been super pleased with the quality of Carhartt items. In the end, I decided on the Women's Skyline Vest. and a ride in the semi during this year's soybean harvest. Besides it being the perfect weight for our recent fall weather, I love the inside pocket. It is perfect for my keys, change, or anything else that I need to keep track of while wearing my vest. So truthfully as much as one can be with a garment, I think I'm in love with my new Carhartt vest. Thank you again to Carhartt and The Real Farmwives of America and Friends! To win a Carhartt of your own, please visit www.realfarmwivesofamerica.com to sign up for their giveaway. Good luck! Carhartt did provide me with this product to review, but the thoughts and opinions expressed here are my own. The color is awesome and you look very stylish and warm in it!